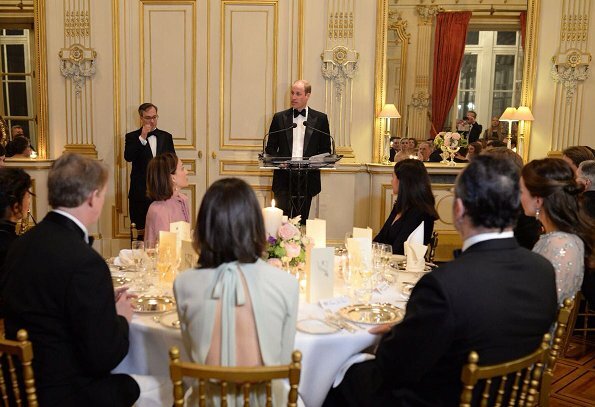 Catherine, Duchess of Cambridge and Prince William attend a dinner hosted by Her Majesty's Ambassador to France, Edward Llewellyn, at the British Embassy in Paris, as part of their official visit to the French capital on March 17, 2017 in Paris, France. The Duchess wore an elegant ice blue Jenny Packham gown for Gala Dinner. Her dress is lovely but I think it lacks a 'je-ne-sais-quoi', a discreet piece of jewellery, although the earrings are lovely too. William looks bored. I totally agree. The dress is very pretty, but something is missing. Perhaps earrings with more visual impact would have helped. lizzie, William always looks bored, i realy do not like him on his duties. Lizzy, I think it is the color. A little bit "pale"? But the dress is! beautiful. 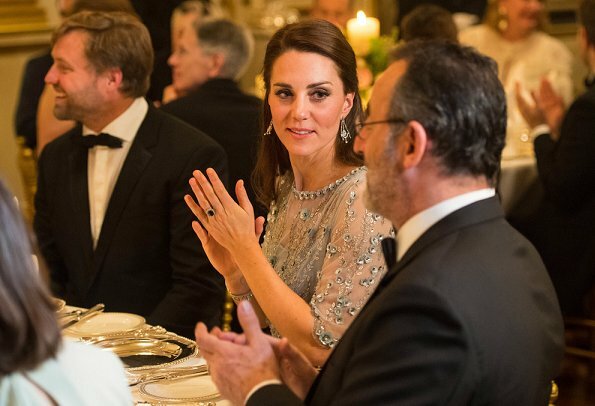 If her table-neighbour is Don Juan de la Moreno alias Jean Reno, the actor, then she might had a'n interesting evening... Maybe better than William's last week-end, ha ha. The dress really is lovely. Beautiful color on Catherine. However, the stringy strands of her hair detract. She should have put her hair up into an elegant arrangement. Pine, true about the hair, not elegant at all. She should have put it up. Also, there is too much of it and it's too long. Nice. 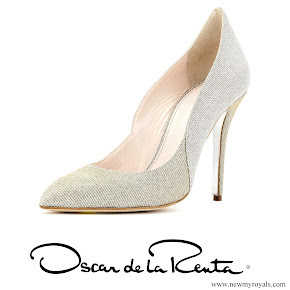 I´d like it even better if it was more icy blue than silver-gray, but it´s a very nice dress. The Duchess looks stunning in the ice blue evening dress, the detail of the dress is exquisite. The black lace dress with the pearls at the embassy welcome was just as stunning and the pearl WOW. Beautiful photographs of a stylish, chic, fashion icon and beautiful flawless skin Duchess. Duke looks very attractive in his evening tux. Well done to both of them. Wonderful dress, shoes and earings, everything is perfect - exept her hair, here is some place often to make her look really georgeous. I do not like this dress at all, and it does not favor her figure, in my opinion too much bling, the hairdo way too elaborate and outdated for such fussy outfit, in my opinion a polished chignon would have been more appropriate. Ultimately Kate is lovely regardless, although she needs to work on her posture. The lady in the pictures with the white dress... oh la la!!! I agree. 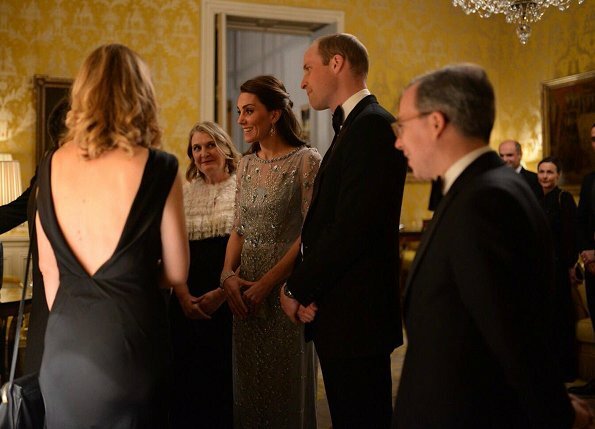 It was a fine dress but Kate typically nails formal attire. I must agree with @Cherry, I am wowed by Lady Llewellyn's choices. Look at the back on her dress! Gorgeous! It is WOW to me, she looks stunning. No need for more jewels. If I had to change something I would have made a nice up-doe. I agree ! An up-do would have finished the look. Otherwise I think she looks quite lovely. The dress itself is beautiful. It does not make for a big 'WOW', because Catherine simply does not have the figure to bring it to life, quite honestly, she has no hips, no bust, she would need another cut to model her figure better. The good girl hairstyle is also too simple for the dress. Dress is also too pale, it would have looked better if it was actually ice blue and with a racy but elegant updo. I prefer the style of the ladie next to her with the floating white dress, modern hair cut and genuine smile. You are correct - genuine smile, lackin in the other person. I guess I must agree. On pic 2 you can see how sadly the dress hangs on her hips. I totally get her style is rather on the toned down side and I bet her wardrobe is under strict royal control/approval but we have seen her doing so much better and figure fitting and interesting. That dress looks great. Like it a lot more than the black one. Am i only the one that noticed that kate never has her nails manicured or painted. No, i noticed that too for a long time. Not even her toenails are done. I think this is because she is a very sporty girl and has two kids? Thank you for the response- i get that for everyday but when going on tour! Boring hairdo, she is not a child anymore. she would look more modern and mature in shorter hair. Such a beautiful dress! Catherine looks stunning. Gorgeous! My first and last thought is "wow"!